2National Institute for Materials Science, Tsukuba, Japan. 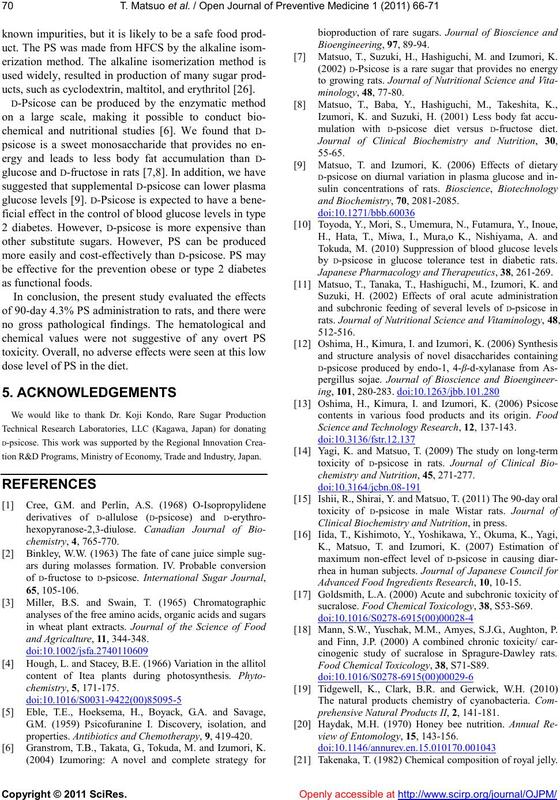 Received 2 June 2011; revised 14 Ju ly 2011; accepted 30 July 2011.
were evident at dietary doses of 4.3% PS. trol of blood glucose levels in type 2 diabetes. utilization as a physiologically functional food [14,15]. corn syrup (HFCS) by the alkaline isomerization method. energy sweetener or food additive is not clear. used as a functional food similar to D-psicose. the Animal Care Committee of Kagawa University. was supplied by Matsutani Chemical Industry, Co., Ltd.
Table 1. Composition of experimental diets. *17% of water is included. D-Psicose includs 85% of solid content. eride (TG), glucose (GLU), and free fatty acids (FFA). formed by Shikokuchuken Co., Ltd. (Kagawa, Japan). follows: –, 0; ±, 1; +, 2; ++, 3; +++, 4. Table 3. 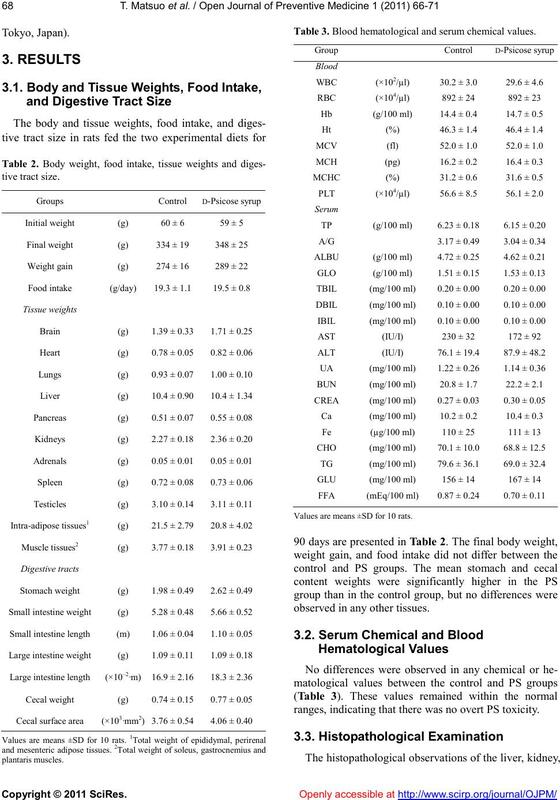 Blood hematological an d serum chemical values. Values are means ±SD for 10 rats. observed in any other tissues. ranges, indicating that there was no overt PS toxicity. small intestine between the control and PS groups. for comparison with 0.5% impurities in the PS diet. Table 4. Histopathological observations of liver, kidney and small intestine1. Values are means ±SD for 10 rats. 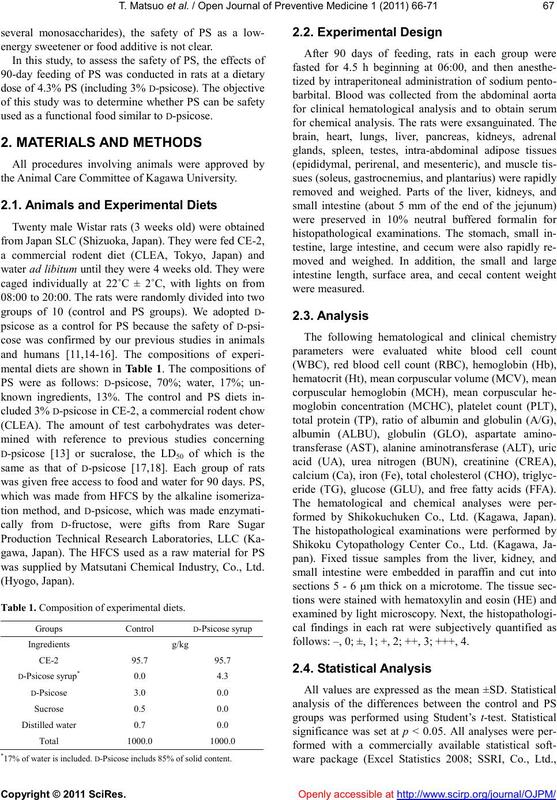 1Quantify the findings level of damage in each rats: –, 0; ±, 1; +, 2; ++, 3; +++, 4.
ucts, such as cyclodextrin, maltitol, and erythritol  . dose level of PS in the diet. tion R&D Programs, Ministry of Economy, Trade and Industry, Japan. and Agricalture, 11, 344-3 48.
properties. Antibiotics and Chemotherapy, 9, 419-420. 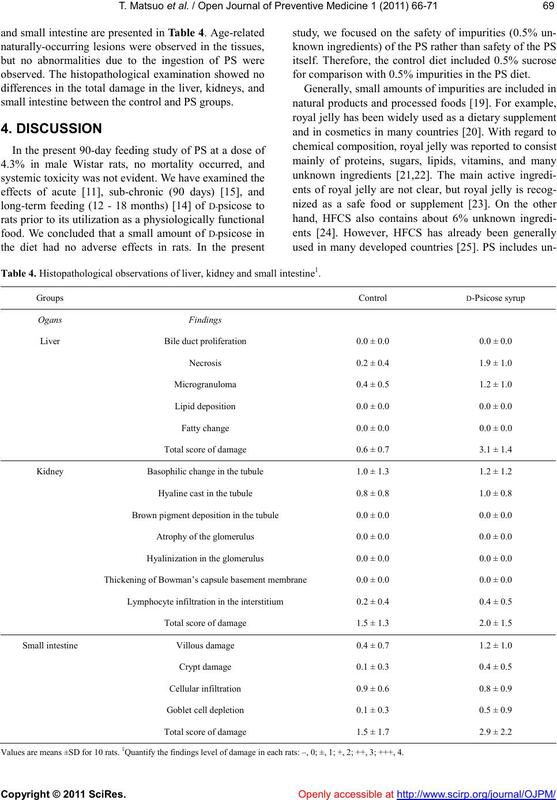 Granstrom, T.B., Takata, G., Tokuda, M. and Izumori, K.
 Matsuo, T., Suzuki, H., Hashiguchi, M. and Izumori, K.
mulation with D-psicose diet versus D-fructose diet. 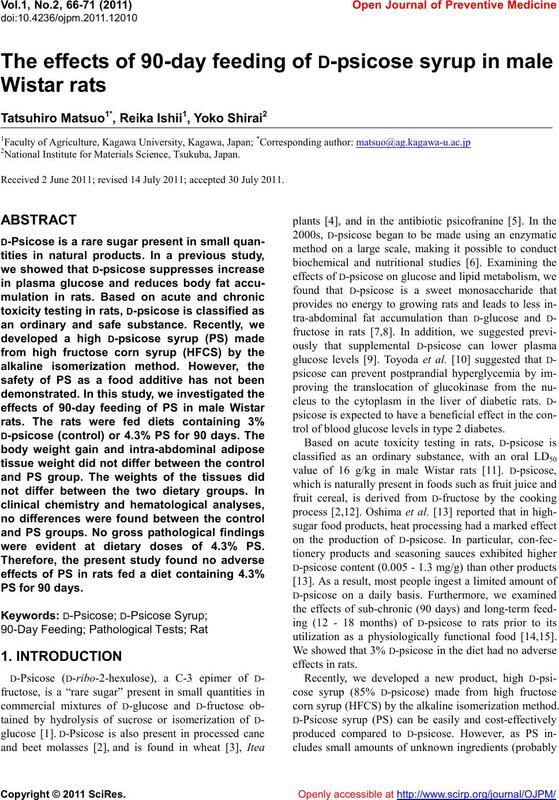 by D-psicose in glucose tolerance test in diabetic rats. Japanese Pharmacology and Therapeutics, 38, 261-269. Science and Technology Research, 12, 13 7-143.
chemistry and Nutrition, 45, 271- 277 . Clinical Biochemistry and Nutrition, in press. Advanced Food Ingredients Research, 10, 10-15.
sucralose. 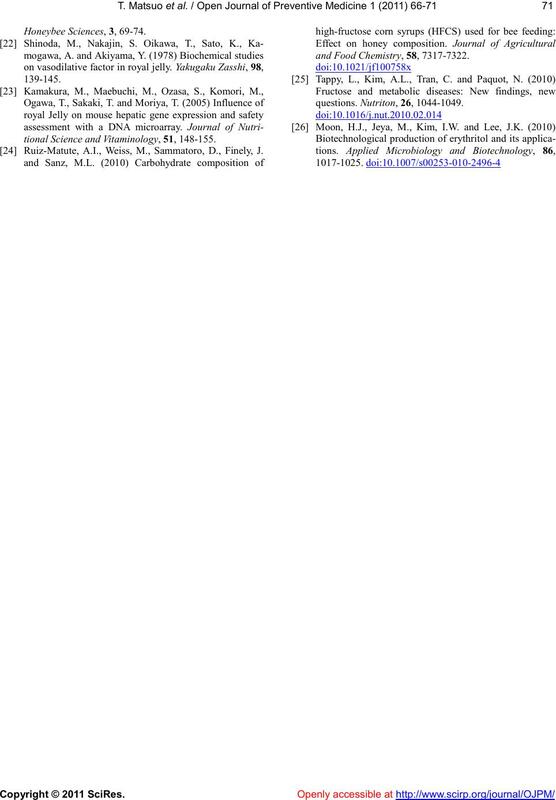 Food Chemical Toxicology, 38, S53-S69. Mann, S.W., Yuschak, M.M., Amyes, S.J.G., Aughton, P.
cinogenic study of sucralose in Spragure-Dawley rats. Food Chemical Toxicology, 38, S71-S89. prehensive Natural Products II, 2, 141-181.
view of Entomology, 15, 143-156. Takenaka, T. (1982) Chemical composition of royal jelly. Honeybee Sciences, 3, 69 -74.
tional Science and Vitaminology, 51, 14 8-155. Ruiz-Matute, A.I., Weiss, M., Sammatoro, D., Finely, J.
and Food Chemistry, 58, 7317-7322.
questions. Nutriton, 26, 1044 -1049.